The right bicycle pedals can make a big difference in the quality of your ride. The pedals that come with your bike are usually the more generic pedals, for that style bike, and are usually standard platform pedals. The platform pedals may have improvements over old designs like different materials, gripping surfaces, and better bearings. Most platform pedals will except toe clips, if you choose, and are fine for most casual cyclists. Using toe clips takes some practice since it requires righting the pedal first as the weight of the system causes the pedal to hang upside down. This is achieved with a quick flick of the toe. To remove your foot from a toe clip you simply pull it straight back. But if you want to boost your performance you need to step up to clipless pedals and bicycle shoes. Clipless" is really a misnomer since the shoe cleat actually "clips in" to the pedal's clips much like you do with a ski binding. The origin of the name goes back to the old style pedals with "toe clips" which were a cyclist's only choice for improved pedaling efficiency. The clipless pedals eliminate the need for toe clips by offering a direct attachment between shoe and pedal. Bike shoes and clipless pedals are part of a natural progression to make your riding more efficient and less tiring. They are a much more advanced pedal-retention system. 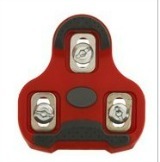 The system works by mounting a small plastic or metal cleat on the sole of your shoe. This cleat then snaps in to a set of spring-loaded "clips" on the face of the pedal. Clipless pedals, when used with the appropriate bicycle shoe, enable the rider to exert force to the pedal on both the upstroke and downstroke resulting in much more efficient pedaling. Your foot and the pedal are linked together as one. When you think about how many times you lift each foot when pedaling ( for instance at a pedaling cadence of 70 per minute ) there is a lot of wasted energy it's easy to see how clipless pedals can do wonders for increasing your pedaling efficiency. Clipless pedals are one of the more popular bicycle accessories. They come in a wide variety of styles and shapes but they are specific to a mountain or road bike and the pedals and shoes must be matched. Cycling shoes need a compatible pedal to hold your feet securely on the bicycle. The so-called "clipless" shoe-pedal combination offers unmatched control with a minimum amount of your pedaling energy loss. The male cleat on the shoe must match the female clip on the pedal. Road bike shoes will only mate to road bike Look pedals. Mountain bike shoes will only mate to mountain bike SPD pedals. The clipless bicycle pedals designed for road bikes are usually Look standard. They are usually much smaller and lighter in weight than the mountain bike pedals. Road bikes are usually ridden longer distances and the lighter weight pedals are a bigger issue. 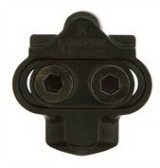 Road cyclists most often use a 3-hole cleat design. This is often called a "Look" type cleat after the company that pioneered its use. These cleats are larger, made out of the plastic and protrude farther from the sole of the shoe than a comparable 2-hole design. The advantage of the 3-hole design is that the large cleat is able to spread the force load being applied to the pedal over a wider area. Road shoes with the 3 hole Look cleat are not well suited for walking since the cleat protrudes from the sole of the shoe and they have no heal. If you plan to do any walking in bike shoes you may want to opt for mountain bike shoes and pedals. Most mountain bikes clipless pedals use the 2-hole cleat design which is often referred to as the "SPD" system (short for Shimano Pedaling Dynamics). Shimano was one of the first companies to develop this system and continues to be a leader in the market today. To mount the cleat to the shoe screws are placed through the 2 holes securing the cleat to 2 tracks or slots in the bottom of a compatible shoe. This lets you slide the cleat back and forth slightly to achieve the proper angle and placement for maximum comfort and ease of engagement to the pedal. Ideally, the cleat is mounted directly under the ball of the foot but can be moved slightly to a more comfortable position if desired. You can experiment to find the ideal position to engage the cleat most easily and pedal with the most comfort. The lateral or "twist" adjustment on the cleat allows them to be set to accommodate different pedaling styles. Cleats are bolted to bottom of the shoe but must also match the pedals properly if they are to engage and disengage safely. This is why cleats are supplied with the pedals and not the shoes. To create a full clipless pedal system, you need 1) Shoes that are drilled to accept the kind of cleat you are buying, and 2) Compatible cleats and pedals (which are sold together). If you wear out your cleats, replacements are sold separately. With any clipless pedal system it is very important to practice removing your foot from the pedal. You do this by pivoting your heel outward usually about 30 degrees. It's nice to be "one with the bike", and pedal more efficiently, but you need to un-clip any time you stop. It's best to practice on the grass because you may fall a few times until you get the knack. Or better yet get a friend to steady the bike while you practice. Again, it's not hard to do but you want to be able to do it instinctively without thinking about it and this takes practice.